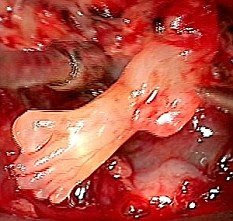 A doctor has removed a brain tumour from a newborn baby which contained an almost perfectly formed foot and parts of another foot, a hand and a thigh. The incredible discovery was made by pediatric neurosurgeon Dr Paul Grabb in Colorado, America, when he operated on three-day old Sam Esquibel after an MRI scan showed a microscopic tumour on his brain. The finding in the otherwise healthy baby is so unheard of it could come straight out of Greek mythology in which king of the gods Zeus produced his daughter Athena fully-grown from his forehead. Dr Grabb, who carried out the operation in Memorial Hospital for Children, Colorado Springs, says that while removing the growth, he discovered it contained a nearly perfect foot, complete with five toes, along with the formation of another foot, a hand and a thigh. 'It looked like the breach delivery of a baby, coming out of the brain,' Grabb said. Grabb is not sure what caused the growth but said it may have been a type of congenital brain tumour. However, such tumors usually are less complex than a foot or hand, he said. The growth may also have been a case of 'fetus in fetu' - in which a fetal twin begins to form within another - but such cases very rarely occur in the brain, Grabb said. But they said the youngster had mostly recovered from the surgery on October 3. 'You'd never know if he didn't have a scar there,' Tiffnie Esquibel said.